The package survey provided function for the Wald test as “regTermTest”. F statistic and P-value will be calculated. 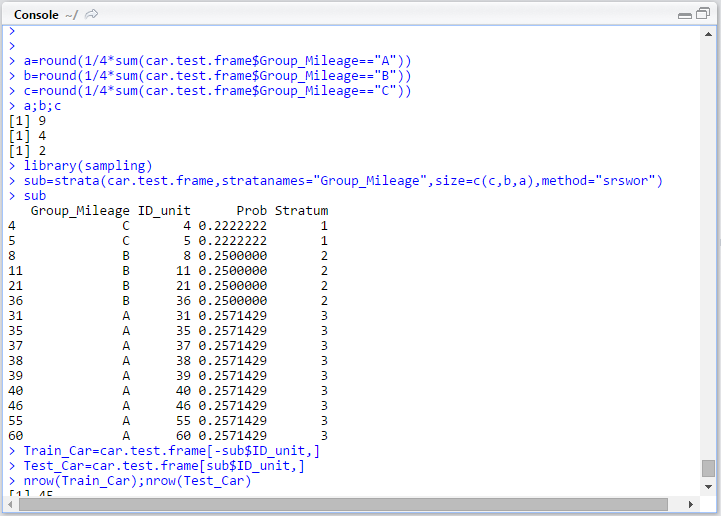 This entry was posted in R, RStudio, Statistics, Uncategorized and tagged logistic regression, Wald Test on March 25, 2017 by gmgolem. Stochastic Gradient Descent (SGD) is an optimization method common used in machine learning, especially neural network. The name implied it is aimed at minimization of function. In R, there is a SGD package for the purpose. As a warm up for the newly upgraded R and RStudio, it is taken as the target of a test drive. Running the included demo for logistic regression. This entry was posted in R, RStudio and tagged Back propagation, logistic regression, machine learning, Neural network, R, RStudio, Stochastic gradient descent on March 6, 2016 by gmgolem. In TI nspire CX, the application Lists & Spreadsheet provided a convenient Excel list interface for data input. The data can also be named by columns and recalled from the Calculator application. Statistical functions can then be applied. Using a sample from the classical TI-89 statistics guide book on determining the interaction between two factors using 2-way ANOVA, the same output is obtained from the TI nspire CX. In R, data are usually imported from CSV file using read.csv() command. There are also other supported formats including SPSS and Excel. For more casual data entry that command line input is suffice, raw data are usually stored into list variable using c() command. Working with ANOVA for data entry in this way is not as straightforward because dimension is required for the analysis on data stored in the list variable. To accomplish the ANOVA, factor data types are used in conjunction with list variable. The below is the same TI example completed in R. Firstly we define the list variable in a fashion of the order by club (c1 = driver, c2 = five iron) then brand (b1-, b2-, b3-, with the last digit as the sample number), i.e. Two Factor variables are then created, one for club (with twelve 1’s followed by twelve 2’s), and another for brand (1 to 3 each repeating four times for each sample, and then completed by another identical sequence). These two Factor variables essentially represent the position (or index in array’s term) of the nth data value in respect of the factor it belongs to, and can be better visualized in the following table. Finally, the 2-way ANOVA can be performed using the following commands. This entry was posted in nspire, R, RStudio, Statistics, TI nspire, TI Nspire CX CAS and tagged 2-way ANOVA, ANOVA, cbind, factor, list, R, TI nspire on December 13, 2015 by gmgolem. Decision tree classification can be done with ease in R with the help from the package rpart. Additionally, the natural outcome of any decision tree is the visualization and can also be conveniently achieved by the package rpart.plot. This entry was posted in R, RStudio and tagged CART, Data mining, decision tree, rpart, rpart.plot on October 3, 2015 by gmgolem. A collection of some frequently used R commands. Creating column for categorical group assignment. Shown below is to assign A/B/C according to some existing values. Similarly for new column for derived values from existing column. Sampling using the sampling package with strata. 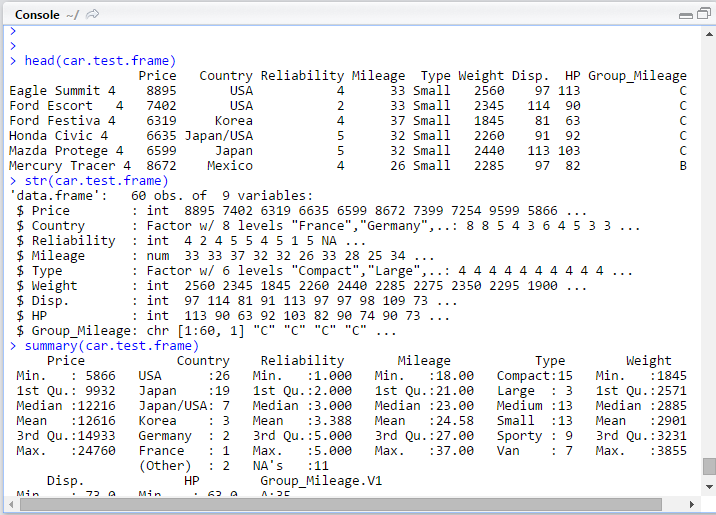 With R Studio, view command can be invoked from clicking the variable under the Environment tab, and the frame will then be listed nicely in a tabular format in the data frame window. Data frame at a glance – head, str, summary. This entry was posted in R, RStudio and tagged categorical column, head, sampling, str, summary, view on October 3, 2015 by gmgolem.